Jonna Lee went from her solo album This is Jonna Lee to the mysterious, conceptual audiovisual collaboration evasively called iamamiwhoami with producer Claes Björklund all in the same year. 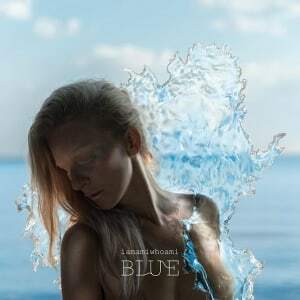 Lee’s musical projects are inordinately concerned with identity, so it’s not surprising that she views iamamiwhoami’s third release BLUE as a reflection of herself in concert with the internet community that forms the backbone of the group’s genesis. For a project that began with shadowed and monstrous music videos and an anonymous front woman, iamamiwhoami has come a long way. bounty and its accompanying videos created the initial stir, but follow-up kin and now BLUE have slowly torn away the meticulously built up mask surrounding Lee and made way for progressively more accessible pop. 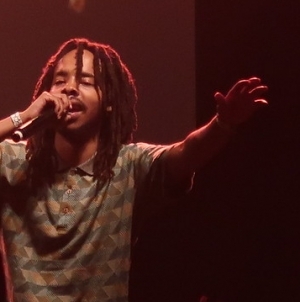 The project is equal parts music, cinematic visuals and Lee’s surreal persona, and must be taken as a whole. But stepping into the realm of iamamiwhoami for the first time can be overwhelming. The bounty videos induced nightmares with an onslaught of recurring images from mandrakes and dancing yetis to Lee covered in greasy black mud. 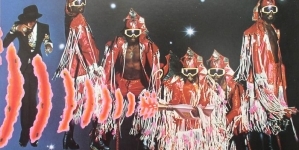 BLUE‘s water imagery and transparent plastic raincoats are child’s play in comparison, but the basic components are all still there: synth-driven compositions, obsessive focus on imagery and concept and Lee’s reverb-laced vocals. BLUE becomes a departure when viewing the sinister darkness of previous releases against the sea-foam aquatics that dominate these new tracks. “Fountain” announces in no uncertain terms the transition from brooding woods to the inviting expanse of the sea. The accompanying dreamy video sees Lee outfitted in pure white and her frosty lashes give the impression of a Scandinavian ice queen. But the music itself is clearer and brighter. Björklund’s production achieves an electro-pop clarity seemingly at odds with the group’s gritty sound. While synths still dominate, they are smoother and in perfect balance with the track’s uncharacteristically simple melody. For all the carefree, aquatic imagery, Lee’s visual character still inhabits a dangerous world. The black jump-suited pursuers of “Hunting for Pearls” are a notable carryover from kin, driving her to the sea as much as Lee herself is searching for a boundless plain with convenient icebergs to dance on. The sounds of bounty and kin creep into the proceedings, most notably on “Ripple” and “Thin.” The former’s title doesn’t do justice to the frenetic syncopation churning throughout the track. “Thin” adds a layer of industrial din on top of twinkling arpeggios, all of which is made to sound at a distance from Lee’s vocal. But iamamiwhoami makes a concerted effort on BLUE to forgo some of the surrealism in favor of more broadly appealing tracks that border on mainstream dance pop, or as close as they will ever get. 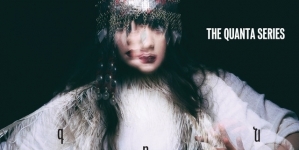 Lush synth lines and epic choruses dominate the album. “Vista” is all simmering grandeur with synths that reflect more than a hint of an ’80s influence, while the rolling synths on standout “Blue Blue” complement a rare intelligible vocal from Lee. But “Chasing Kites” is the understated successor to both, blending radio-friendly structure with familiar pop. Closer “Shadowshadow” swells with an intoxicating dance beat but once again betrays the underlying menace in these tracks with its palpable foreboding. The cascading waves of “Fountain” have evidently made way for the rebirth of iamamiwhoami. The duo is washed clean of the claustrophobic nature of their previous material and boldly presents their take on Scandinavian dream pop. The artistic choice points toward broader accessibility, but the decision cannot be said to be safe. 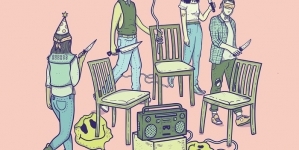 For a project whose cult appeal was mysticism and intrigue, glacial dance pop is an unexpected turn, but one that will undoubtedly go in their favor. Rose Kerr is a blogger and freelance film critic. A childhood filled with movies set her on the path to become a self-taught cinephile, with the help of her local library's film collection. She only knows the answers to Trivial Pursuit questions in the Entertainment category.